Provide comfort for the family of Shirley Watson with a meaningful gesture of sympathy. Watson, Helen Shirley (Hunt) peacefully at Pembroke Regional Hospital on Sunday, December 16th, 2018 at the age of 87. 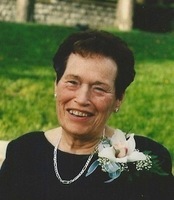 Beloved wife of the late Arthur "Joe" Watson. Loving mother of Janie (Wayne Nichol), Mary (Jerome Afelskie), Jack and special mom to Jackie Schroeder, and Sylvia Paton. Grandma to Taylor (Sarah), and Kayleigh. Great-grandma to Blake. Survived by her sister Mary Miller, as well as her sister-in-law Ruth Hunt. Predeceased by her infant daughter Susan, as well as her brothers Jackie, Garry, and Sterling. Many thanks to the close friends of Shirley who often called and visited on a regular basis. Professional arrangements have been entrusted to the care and compassion of Zohr Family Funeral Home, Eganville. Celebration of Life will take place at Royal Canadian Legion Branch 353 Eganville, on Sunday, December 23rd, 2018 from 1-4 pm. As per Shirley's request for a good old-fashioned kitchen party, please bring your voices and your instruments to help celebrate her life. We encourage you to share your most beloved memories of Shirley Watson here, so that the family and other loved ones can always see it. You can upload cherished photographs, or share your favorite stories, and can even comment on those shared by others. Katie, Brandon, Teri, Lori and Jack sent flowers to the family of Shirley Watson. Our thoughts and prayers are with you and your family Janie. In memory of our cousin, our former neighbor and a great lady.